Social networking sites for teachers are more than just a place to meet new people, connect with former classmates. Teachers go into work daily and expect the unexpected to happen which is why social networks that are secure are important as they offer a sounding board for ideas, support from peers and provide the teacher with an access to techniques and programs that are in place across the world. EducatorsConnect is a paid, private social network designed specifically for teachers. Members can collaborate on projects, share ideas, and have access to lesson plans and teaching tips as well as classroom experiences. Blogs offer a glimpse into another classroom and what best practices are put into effect. As a secure site, EducatorsConnect allow teachers to blog, form discussion groups and chats that are safe from search engines so that information does not become public which would endanger their position as a teacher. 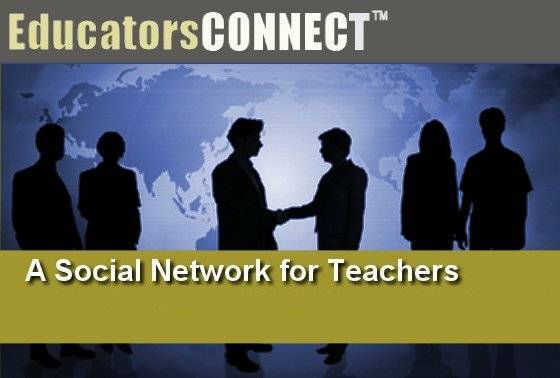 Social networks like EducatorsConnect also allow teachers to network and search safely for new job opportunities across the country as well as expand their opportunities within their area by building a professional network. Do not make the mistake of confusing professional networking sites with social networking sites. Sites that are set up and run like EducatorsConnect in place mainly for professional development with a small amount of social networking involved. One does not post pictures of the family outing on EducatorsConnect but nonetheless the social networking in a professional manner is just as important to the teacher in allowing the teacher to safely discuss the workday with people who can understand and offer real world solutions to a problem. This is an assumption that many new teachers have made which has lead to job termination as classroom information was discussed outside a professional avenue. Teachade.com is a social networking site for teachers that also offers an online bookstore, an electronic database of reviewed resources for use in lesson plans, members from the K-12 teaching community as well as college professors and commercial members. The primary function of Teachade.com is to enable online teacher communities that encourage sharing of resources. Teachade.com does not have the ability to maintain personal blogs, real-time chat rooms nor does it have a job opportunity networking function. The site does offer a large database of professionally created and checked lesson plans in many education categories that often aren’t included in other sites such as music, student wellness and information about professional development courses. Social networking sites for teachers need to be held to a higher standard to protect the teacher. When looking for a social networking site specifically for teachers remember to keep in mind the primary goal of the site and protect information accordingly.